Calling all ABBA fans! After ten years, Mamma Mia is back and better than ever. 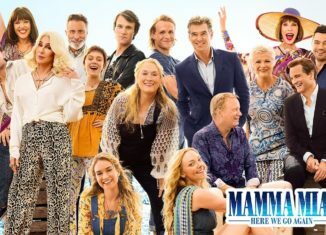 Following many trailers, promotions, and anticipation, Mamma Mia: Here We Go Again! was released on July 20th. Attracting the loyal fans of Mamma Mia, as well as new sets of eyes, this movie has taken the box office by storm. In the favor of every Mamma Mia fan ever, the movie opens with Sophie (played by Amanda Seyfried) singing “Thank You For The Music,” a classic Mamma Mia song. The movie is first set in the present day as Sophie is preparing for the reopening of her late mother’s, Donna’s, hotel. Less than five minutes in, the movie flashes back to Donna as a teenager (played by Lily James). This constant flashback becomes an important storytelling tool throughout the movie. During the flashbacks, the audience is introduced to the story of how Donna met Sophie’s three dads: Harry, Bill, and Sam. When the movie is set in the present, the plot is focused on Sophie’s rebuilding of her mother’s hotel. We see the struggle and hard work that is put into this project because Sophie wants nothing more than to make her mother proud. In addition to the genius plot, the soundtrack of the movie surpassed all expectations. The inclusion of classic songs such as “Thank You For The Music,” “Dancing Queen,” and, of course, “Mamma Mia” made the die-hard fans smile to no end. The addition of new songs including, “When I Kissed the Teacher,” “Kisses of Fire,” and “Andante, Andante” made ABBA’s fans extremely happy. The music and storyline flowed so smoothly together and truly created an amazing movie experience. The director of the movie, Ol Parker, did an incredible job with mixing certain aspects from the original with new ideas in the sequel. Anyone who walked into the theater at the start of the movie definitely walked out with a smile on their face and one of ABBA’s songs stuck in their head. If you were a fan of Mamma Mia, you have to make your way to Mamma Mia: Here We Go Again!